The following was written by Larry Baxter at his blog Step Up to the Call. 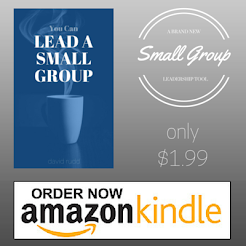 He has some good thoughts on how to build a sense of community in a small group. 2. Intentional about being a safe place to ask questions - The group leader takes a few minutes during most meetings to talk about what is going on in the life of the church. People are free to ask the "why" behind what we do, and get good answers. So talking about a special baptism day was very natural for them, not a big pitch. 3. Intentional about outreach. This is one of our largest small groups. The group members really love getting together, and have taken it upon themselves to ask just about every new person they see to come to their small group. There are many young adult couples, many without a Baptist background, and several have never really thought about being baptized. By talking about it both in the group and one-on-one, they were able to get over any concerns or fears they had - and having a friend getting baptized at the same time made it far easier to take that step. 4. Intentional about spiritual growth - this group leader had already spent some quality time with one of the women considering baptism, without any agenda. This did help build trust, and also allowed her to be comfortable asking her friend to consider baptism. Sometimes as leaders we do need to "make the ask" and encourage people to take a next step as a disciple; this is best done when we know each other as individuals. 5. Intentional about distributed responsibility for ministry - one cool thing that happened was that a fourth group member was the 'baptism helper', walking the others through the process and making sure they had clean towels! The attitude of the group leader was for people to genuinely care for and serve one another, and not for the group to be dependent on her, or let others do all the serving or caring. 6. Group responsibility for building community - the whole group owns this, it's not the leader's job; that was one of the most encouraging parts of our conversation. The group leader really didn't feel like she had done anything too special to "push" community, rather she fostered an environment where community arose organically.